For Pitt students of all ages, the end of the fall semester is a time for studying, planning vacations and searching for rentals — and not necessarily housing rentals. Students looking to try before they buy can check out a variety of rental services that fit into a college budget. While some services are seasonal — such as kayak rentals and ice skating — others are available year-round, with options to rent everything from musical equipment to bicycles to the top floor of Peter’s Pub. Whether you’re looking for something fun to do during the holidays or just need a break from apartment hunting, renting can be an affordable option — either on campus or just a bus ride away. Every year from late November through late February the Massmutual Pittsburgh Ice Rink at PPG Place offers an all-ages seasonal activity with downtown views and holiday events. A common nighttime spot for Pitt students during the winter, the rink — which opens Nov. 17 for this year’s season — drew sophomore microbiology major Maddie Broadbelt and her friends several times last year. Admission to the outdoor ice skating rink is $8 for adults, with skate rentals costing $4 and lockers available for 50 cents. Group rates and skating lessons are also available at the rink. As students move off campus and into apartments, they may sublet or face a gap between leases when they need to store their furniture somewhere safe. One solution students often choose is storage facilities. Senior Morgan O’Donald, an emergency medicine major, has lived throughout South Oakland since her sophomore year. During the summer of 2016 she rented a storage unit from the U-Haul Moving and Storage of Oakland. For renters with fluctuating numbers of roommates and pieces of furniture, storage units can be a convenient resource — but it is important to get an accessible unit with ample space, O’Donald says. Zipcar — an alternative to traditional car rental and ownership — provides a carsharing service to drivers 18 years or older. In exchange for a membership, drivers are able to use a Zipcar-owned car for any amount of time between one hour and seven days, with gas and insurance included. Rates vary depending on location and the type of car a user chooses. 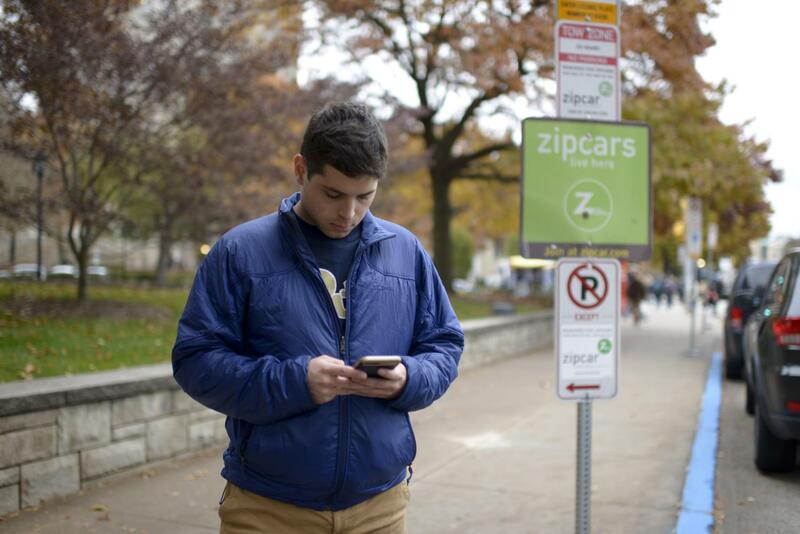 As his prize for winning a giant inflatable beanbag toss game before a Pitt football game, Ian Snyder, a senior political science major, won a yearlong Zipcar membership and $50 credit. Snyder says now that his free yearlong membership is over, he will begin paying the student membership, which is $15 a year — a $10 discount for Pitt students. The second floor of this Oakland Avenue pub is a popular venue for Pitt students and Greek life, but mixers and socials aren’t the only parties Peter’s will host. In addition to the pub’s weekly karaoke nights and football Sundays, every Thursday through Saturday night the second floor is available to rent from 7-10 p.m. In addition to food, drinks and staff, Peter’s offers a full sound system, lights, a projector screen and DJs or live music. Partygoers are welcome to bring additional decorations for themed or seasonal parties. “Especially for the holidays we have a lot of Christmas parties with doctors bringing their entire lab or floor, typically,” Brennan said. Healthy Ride is a citywide bike sharing system in Pittsburgh. Cyclists can pick up a bike from one of 50 stations scattered throughout the city, then return their bike to any of these same stations. Those who are 18 years and older can register for the system through an app on any mobile phone, then pay through a credit or debit card — the “pay as you go” option costs $2 for every 30 minutes. Those who are registered for Healthy Ride are eligible to rent up to four bikes at one time, each at the same rate. The entire renting process takes place through the mobile app and a keypad transaction for removing and returning the bike at each of the stations.